This year's backpacking trip took us on an 8-day traverse in the Sierra Nevadas. We left Corvallis on Thursday evening and headed south, our permit was for a Saturday start at the Taboose Pass trailhead. On route we rented bear cans at Mono Lake and dropped a car at North Lake, our final destination. It was hot (100+ degrees) on the east side of the Sierras! We spent Friday night in Big Pine and headed to the Taboose Pass trailhead early Saturday morning. The road from Highway 395 to the trailhead is rough, it takes us about 30 minutes to go 5 miles, we are thankful to have a high clearance vehicle, but we wonder how the Prius will do in 8 days. The Taboose Pass trail starts in Onion Valley in the desert, full of black lava rocks and sage brush at 5430 feet . It climbs to 11,352 feet in 8 miles. And we find out it lives up to it's unfavorable reputation. There is minimal shade and it is already hot when we start. Up we go, not too bad but Todd is hot, we take long breaks about every hour in the available shade and finally make it up the pass in early evening. The top is definitely breathtaking; above timberline we pass meadows, tarns and endless wildflowers, it's as if we have entered another world! We see Bench Lake and Arrowhead Peak, our destination 2 years ago. We head down through the meadow and look for a place to spend the night, stopping to watch 7 large bucks foraging in the meadow as we descend. Day 2 starts with some mosquito swatting and we head down through lodgepole pines to the John Muir Trail (JMT) and go north. We stop just short of Mather Pass and climb Split Mountain, just over 14,000 feet which offers a great view of the Southern Sierras. The climb takes us 5 hours round trip from the JMT, not the 3 hours we had planned. The elevation is definitely slowing us "sea level" folks. Nonetheless we make a quick ascent of Mather Pass and head into the Palisade Lakes, Anne has incorrectly calculated the mileage to the lower lake and it's 4 miles not the 1.5 miles she thought. Thankfully we find a tent spot above the upper lake and make it into the tent just as it gets dark. We wake early on day 3 and head to the lower Palisade Lake, we watch fish jump out of the water to grab their breakfast of mosquitoes as we hike by. 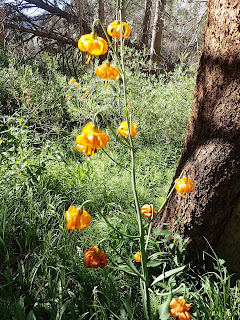 It is just past the lower lake where we leave the trail to join the Sierra High Route (A 195-mile cross-country hiking route through the Sierra Nevada that primarily traverses off-trail meadowlands, granite slabs and at high elevations difficult loose talus terrain. We completed part of the Cirque Country section 2 years ago). We have read, reread and studied our maps as we start the ascent of Cirque, Potluck and Knapsack Passes. We pass some beautiful tarns as we ascend Cirque Pass and thankfully find a route that isn't too treacherous. At the pass the mighty North Palisade greets us and looking south we can see Mather Pass. The descent from the pass starts in a narrow steep chute and thankfully Andrew shuttles Anne's pack through this obstacle (a maneuver that will be repeated many times over the next several days; Todd, Andrew, and Jacob all graciously helping Anne in the difficult sections). Our next obstacle, Potluck Pass, takes two tries to ascend but eventually a relatively simple scree slope and some narrow shelves lead us to the top. Looking north the huge Palisade Basin lies in front of us. We descend the pass and head toward "inconspicuous saddle", en route we pass a grouse with 3 little fluff balls camouflaged as rocks. It is in this section that we once again encounter bothersome mosquitoes. We head over the saddle and towards the Barrett Lakes, we avoid swampy areas on the descent and consequently end up on the wrong side of the largest Barrett Lake. We make the best of it and decide to find a tarn to cleanup in along with a tent spot and call it a day. The mosquitoes continue to be bothersome but we do get a quick dip in a warm tarn and find a spectacular tent spot on a ledge. We spend the evening in the tent and play the first of many games of Froggy Farkle. We are greeted by the buzz of mosquitoes on the morning of day 4. We find a path off the ledge, Anne again needing a pack shuttle to descend and head toward Knapsack Pass. The ascent goes quickly and we are eyeing Columbine Peak at the top of the pass. Andrew is ready to climb but the rest of us are intimidated by the jagged ridge of talus. 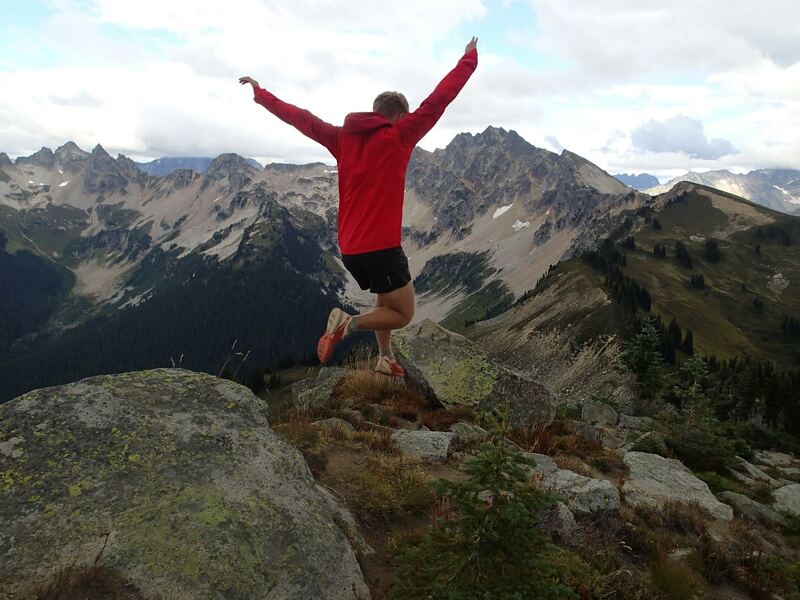 We meet 3 other cross country backpackers on the pass and a request for a picture with the Western States Winner is granted. We make a careful descent of the pass down a series of granite benches and make our way through Dusy Basin. We make our way past the lowest lake and join the Bishop Pass trail and drop into LaConte Canyon. 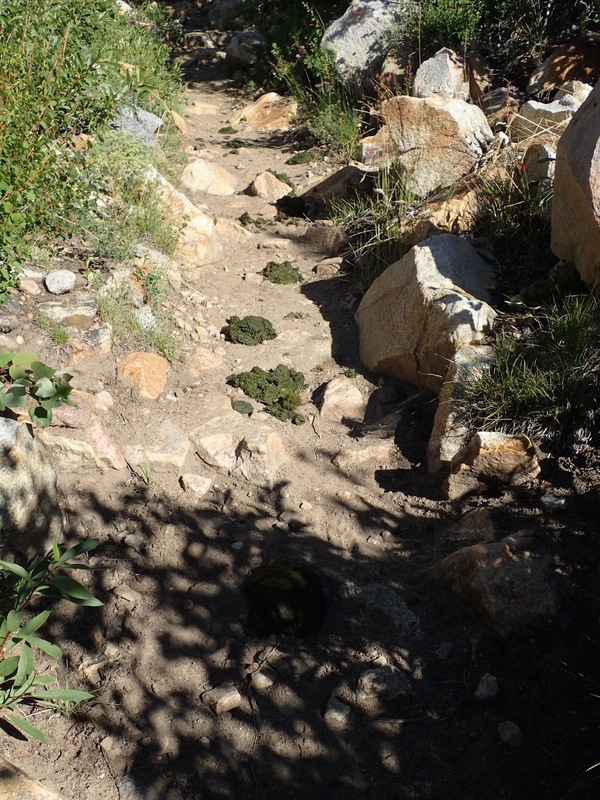 The trail drops over 3000 feet to meet the JMT. We are distracted during the hot descent by watching a stream flowing madly down an impressive granite slab along with viewing an enormous Sierra juniper with a circumference of nearly 30 feet. We again join the JMT and head north toward Muir Pass. It's on this section we pass Andrew and Jacob's K-5 Physical Education teacher along with our first horse packers. One rider remarks that he is tired and we all hold our tongues and walk in silence. We stop short of the pass hoping to find the tent spot we stayed in 3 years ago. To no avail we find an adequate spot to spend the night. Day 5 we head toward Muir Pass. We leave the JMT near Helen Lake and head toward Black Giant Pass. We decide to loop through the Ionian Basin instead of crossing Muir Pass. The Ionian Basin is a region virtually devoid of vegetation and it's unique and beautiful. Once we gain the pass we get a quick snack and climb Black Giant. Again the sweeping views are impressive from the summit, we can see where we've been and where we are headed, the Sierra Nevada is immense. We spend a bit of time on the summit, descend quickly and reach the pass just as rain drops begin to fall. We start to descend the pass and it is now raining, we are surprised at how quickly the weather changed. We also realize we are lacking proper rain gear, Anne is not sure how we overlooked bringing rain pants and substantial rain jackets. Thankfully we do have pack covers. Things do not improve quickly; the talus field is steep, it's becoming wet and slippery and now it's hailing. We make it to the bottom of the first bench where we easily pass a large tarn and head down another section along a waterfall to a lower bench with a smaller tarn. The hail continues and Anne and Andrew are freezing. We take cover under a rock to try to wait out the storm, we are above timberline so this is our only cover. Things don't improve quickly, it's now hailing with lightening and thunder. We are getting colder under the rock and Todd and Jacob decide to make a mad dash out to find a tent spot to set up the tent; they take off, Anne and Andrew soon follow; they thankfully have found a level spot and have the tent set up when Anne and Andrew arrive. We all take cover in the tent, take off our saturated clothes, put on our long underwear and down coats and warm up in our sleeping bags. After 4 hours the storm is over. We head out of the tent to eat and hang our wet clothes on a make shift clothes line. The sky is now clear. Day 6 dawns and we are headed over Wanda Pass back to the JMT. After reviewing the maps we realize we need to drop down to Chasm Lake before we head up to the pass. The descent takes us past one tarn before we drop into Chasm Lake. Chasm Lake is surrounded by steep rock walls, there was no wind, so it's blue color makes it look magical. We don't drop to the lake but climb up a waterfall to leave the bench, we ascend to a higher bench with another tarn, we then identify and head toward Wanda Pass and cross the Goddard Divide. The ascent of Wanda Pass is straight forward, the descent a bit trickier as we need to avoid sheer drop offs, the talus is huge which is slow but we make it to Wanda Lake. 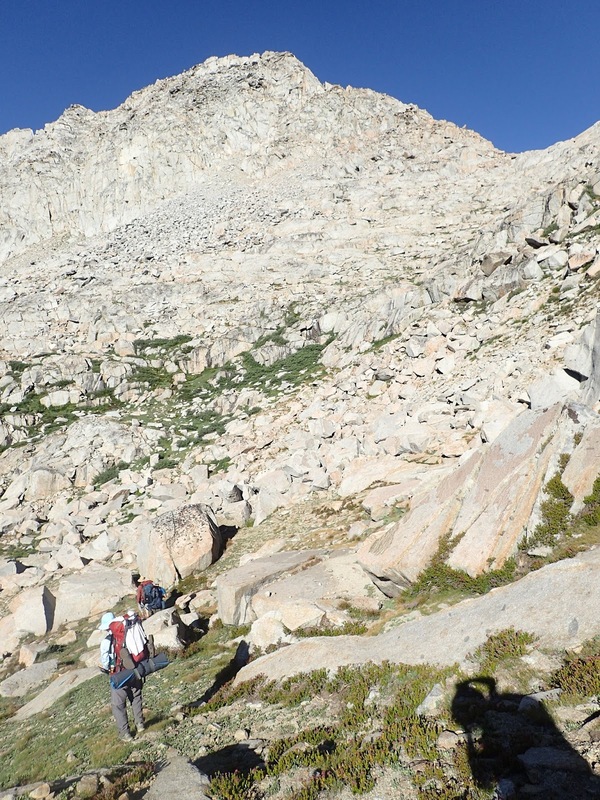 We head around Wanda Lake back to the JMT, this traverse is also slow due to the huge talus. We make it to the JMT and head toward Evolution Lake our destination for the night. During our descent the sky again darkens. Andrew wants to know the plan if it starts to rain again. We put the pack covers on and shortly it starts to sprinkle. Andrew says look for a family size rock to get under, Anne spies one near Sapphire Lake and heads in that direction. We all make it to the rock and take cover. It's now raining and we're in for a long wait. We stay under the rock for almost 4 hours before the rain subsides, we have a great vantage point to watch other backpackers take cover and share the rock with 2 JMT hikers for a while. When the rain finally stops we decide to head down to Evolution Lake primarily to warm our wet feet. We find a tent spot, eat and head into the tent as darkness settles in. In the tent we review maps and make tomorrow's plan. We need to cross Alpine Col and given the last 2 day's thunderstorms decide we need to be over the col by 2 pm to be safe. Day 7 we wake early and head down the JMT, after 1/2 mile we again leave the trail and make our way to Darwin Bench. There is a use trail heading to the bench so the going is easy. Darwin Bench is beautiful and full of wild flowers. We pass the first lake and make our way toward Alpine Col. We had hoped to climb Mt. Goethe but as the clouds start to build we decide to forgo this ascent. We continue to head toward the col, the next lake again is surrounded by large talus and this time steep snow slopes. Thankfully the snow is soft, Andrew and Jacob kick in steps and we are able to cross, Anne again needing a pack shuttle. We ascend a bit and reach the final lake before the col. We assess getting around the lake and can't make a definitive call even after Andrew scouts the route. We chose to go around the west side of the lake only to find difficult large talus with numerous snow crossings; here we split, Anne and Todd going back to traverse the east side, Andrew and Jacob traversing the west, they also take Anne's pack and help both of us up the col. We spend minimal time on top and try to quickly descend, only to find it difficult. Once again we encounter large talus and drop offs. After almost reaching a dead end we find a chute we can descend, get into large talus and make it to the bottom. Clouds are building. We decide to go around Goethe Lake, another tedious talus heap, make it through, go around the tarn on the bench below, again crossing another tedious talus heap. Then we are in the meadows above Muriel Lake. After moving slowly all day it was a just reward. The clouds never did build enough to rain on us but once again we are in mosquitoes and seeing people. The primary bonus of off trail backpacking is the solitude. We spend the night above Muriel Lake, enjoying the open Humphries Basin and playing Froggy Farkle. We are up early on day 8, hike cross country to Piute Pass, quickly descend the trail, our descent slowed by two groups of horse packers, and arrive at North Lake by 9:30. We load the Prius, stop in Bishop for fresh produce and bread at Eric Schat's Bakery, and head back to Taboose Pass trailhead to get the other car. Todd is able to maneuver the Prius through the mine field and we make it to the trailhead only to find the battery dead in the Subaru! ****! We are able to get enough cell service to call AAA but help isn't arriving soon and trying to explain exactly where we are seems pointless. To top things off the temperature is over 100. Nonetheless Anne and Andrew decide to stay with the Subaru and send Todd and Jacob to the highway to flag down the AAA vehicle should it actually show up. Todd and Jacob have a long drive home ahead. As Anne and Andrew wait 2 backpackers come down the trail and miraculously have a battery jumper! They give us a jump and we were finally on our way heading to Flagstaff where Andrew will spend the rest of the summer. Droppings from our horse friends, yet we are asked to carry out our toilet paper ?!?! 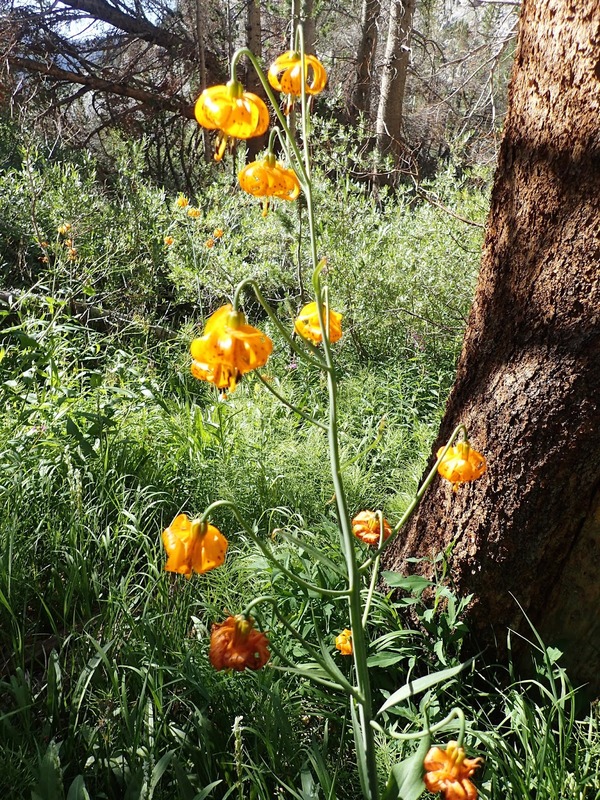 The trip was wonderful, late July posed challenges (mosquitoes and snow) but the wildflowers were incredible. Great adventure! Loved reading the recap and seeing the photos. Glad to see you all enjoying the wonderful outdoors! Beautiful.